Even though I live in Oregon, the state known for being very wet and rainy “all the time,” I still find I have dry skin, and am basically a huge moisturizer addict. I hate putting weird ingredients on my skin though, and love making my own stuff, but am also busy and lazy – so enter the simplest homemade body butter. I’ve been messing with recipes for a while now, and this is the journey. Tip: this is a long post, if I’m boring you, I take no offence, read the very end for the punch line. I ain’t kidding when I say I’m going to tell you the simplest body butter you can make, but this post not just a sweet recipe, it is also a picture show preview of multiple different options so you can see which way you might want to go when making your home made body butter. I found when first making homemade cosmetics and things that there are a lot of different body butter recipes out there on the interwebs, a lot of unnecessary complicatedness and a lot of pretty pictures. I gotta say though, I’ve tried these a dozen times, and it ain’t easy to make it look pretty. So screw you Pinterest, these are what it will actually look like if you make it. I’m also kind of against the whipped ones just for laziness reasons, because it makes a mess of either a hand mixer or a blender, and you loose some ingredients in the process. So my butter can be made in 4 simple steps. Combine, melt, refrigerate, stir. So, what do you need? You need butter (Shea or cocoa work great – not like the edible kind you put on toast 😉 ) and a liquid oil. I used avocado oil for this endeavour. I find it to be one of the less greasy oils, but you can also use sweet almond, macadamia, grape seed, olive, coconut, whatever you want really. Jojoba oil (which is actually technically a wax) is supposedly a great one because it’s similar to the composition of our skin or some business like that. It is nice, and also quite none greasy, but it’s a little on the spendier side, so that’s why I love the avocado. So that’s it, all you need! Pick at least one oil and butter. Optionally you can also add beeswax to the mix, and I’ll show the comparison in a moment, but it’s not really necessary. 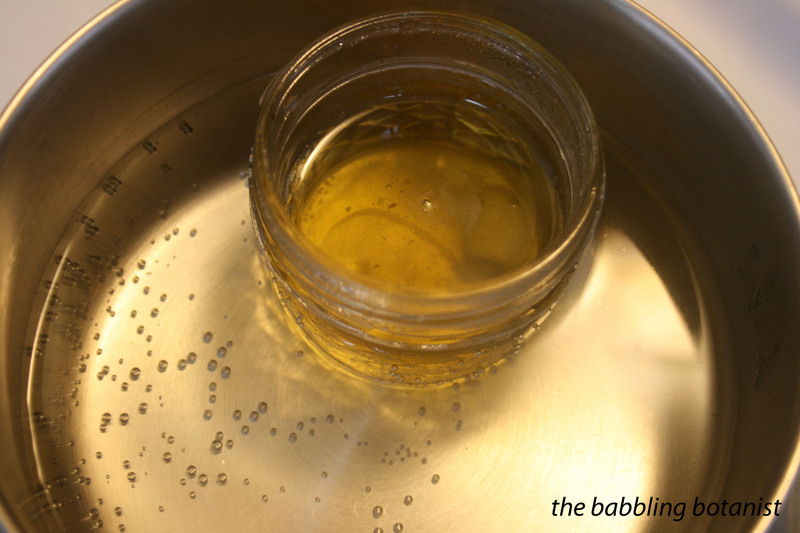 So, all you have to do is combine the butter and oil in a wee glass jar, this is a 4oz canning jar, and heat it in a double boiler to melt. Give it a quick stir and then remove from heat. Cooling them in the refrigerator helps to avoid separation while they cool. I like to cool it over night, then take it out in the morning and stir after it sits for a bit to warm up slightly. Maybe an hour or so. The best stirring device I’ve found is the reusable kebab skewers. Very handy. BAM you are done. Now I realize I gave you no ratios there, here is the picture show part of this post, you have to read on for the answer (or interpret my code on the above jars 😉 ). Here is the cross comparison of seven of my trials. Softer ones are on the left, the hardest on the far right. So here are the ratios, starting from the left. I’ll zoom in on a few of these comparisons in just a second, so bear with me for this list. PHEW, OK that was a bit overwhelming, come on babbling, tell me what to use. Well let’s look a little more closely so we can see the differences in the qualities of the butters, and at the consistency differences between ratios. Below is a simple comparison of 2:1 ratios. On the left is 2:1 avocado to Shea, middle is avocado to cocoa, and right is coconut oil and Shea butter. As you can see, 2:1 oil to butter ratio is pretty liquidy, and this is very temperature dependant. The coconut oil is very hard here, but add a few degrees to the room temperature and it quickly melts. Cocoa butter also gives a harder consistency than Shea. Now a comparison of different ratios. These are all avocado oil with Shea butter. Again from left to right, avocado oil to Shea butter we’ve got 2:1, 1:1, 1:2 and at the far right a 3:3:1 with the 1 being beeswax. 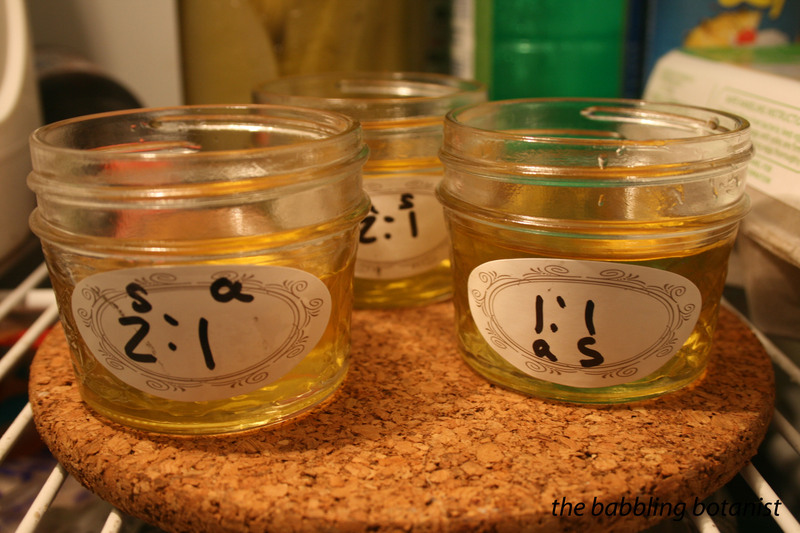 The 3:3:1 oil to butter to wax has a very similar consistency to 2:1 butter to oil. – Don’t try to mix water (or something water based like aloe) and oil without an emulsifier – like if you want something a little more lotion-like. I just bought some emulsifying wax, so more experiments coming soon! I think if you really whip it, success can be had, but I have not yet mastered this skill. 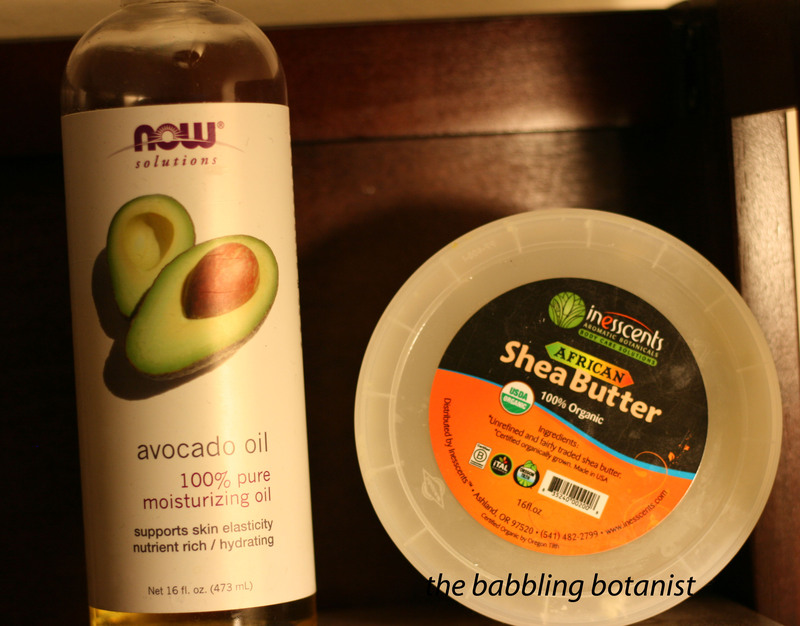 – Go ahead and mix different oils and butters all together and explore the options! – Coconut oil is the most temperature sensitive since it’s melting point is right around room temperature, so I wouldn’t recommend using it as the only oil, but it smells great so use a bit of it for it’s scent and moisturizing properties. Or add beeswax to the mix with coconut oil to make it more temperature stable. 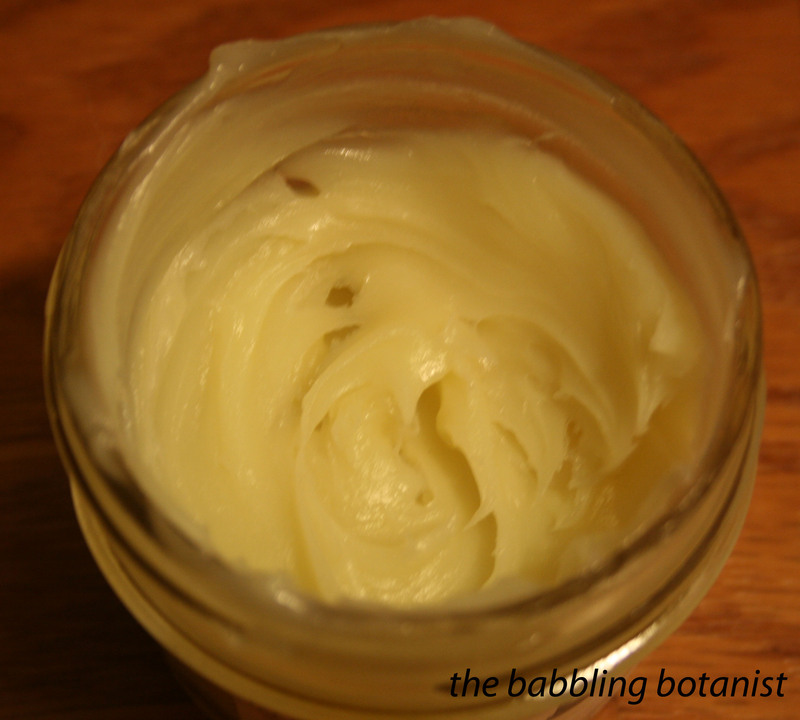 Do you make homemade body butter? What’s your favorite recipe? Got a recipe you want me to test out, I’m always up for a challenge. Thanks for the advice. I ran out of homemade stuff and need to make myself some more! Oh no! Good timing though. I hope you find a recipe you love! Wow, that was better written that any paper I’ve ever read… will try it! !